NETWORK FINALS: THE MIDDLE, the season finale of CHICAGO MED and NCIS gained 0.1 in final numbers, while THE 100 lost the same. CABLE HIGHLIGHTS: ESPN’s NBA PLAYOFFS game owned the night at 3.25, and the preceding NBA DRAFT LOTTERY special was at 0.97. 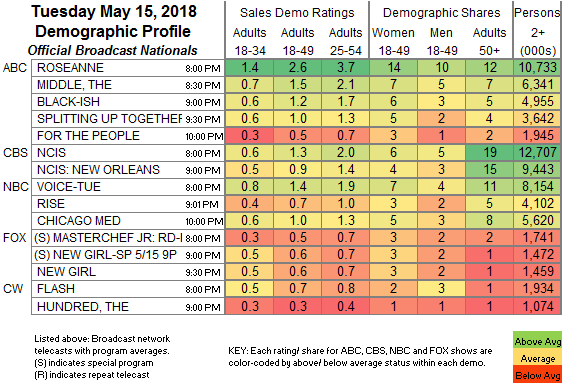 On USA, WWE SMACKDOWN ticked down to 0.70, CHRISLEY KNOWS BEST dropped 0.08 to 0.43, and THE CROMARTIES was down 0.03 to 0.20. NBC Sports Net’s NHL PLAYOFFS game was at 0.53. 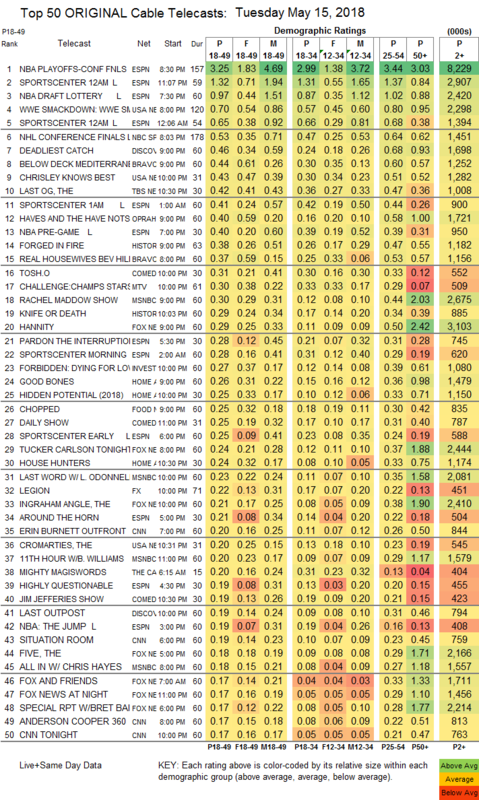 On Discovery, DEADLIEST CATCH edged up 0.02 to 046, and LAST OUTPOST was down 0.02 to 0.19. The season premiere of Bravo’s BELOW DECK was at 0.44. and lead-in REAL HOUSEWIVES OF BEVERLY HILLS fell 0.25 to 0.37, with lead-out SELL IT LIKE SERHANT at 0.13. TBS’s THE LAST OG dipped 0.03 to 0.42. OWN’s THE HAVES AND HAVE NOTS rose 0.04 to 0.40. On History, FORGED IN FIRE lost 0.04 to 0.38, and KNIFE OR DEATH was down 0.08 to 0.29. On Comedy Central, TOSH.0 ticked down to 0.31, and THE JIM JEFFERIES SHOW was down 0.04 to 0.19. MTV’s THE CHALLENGE was down 0.02 to 0.30. MSNBC’s RACHEL MADDOW SHOW regained the cable news lead in the demo at 0.30/0.44/2.7M, with Fox News’s HANNITY at 0.29/0.50/3.1M, and CNN’s SITUATION ROOM at 0.19/0.23/800K. On ID, FORBIDDEN ticked down to 0.27, and WEB OF LIES crashed by 0.11 to 0.16. On HGTV, GOOD BONES dropped 0.05 to 0.26, HIDDEN POTENTIAL was at 0.25, and HOUSE HUNTERS fell 0.08 to 0.24. Food Network’s CHOPPED shed 0.03 to 0.25. FX’s LEGION jumped 0.08 to 0.22. Paramount’s INK MASTER: ANGELS rose 0.04 to 0.15. On TLC, LONG LOST FAMILY was at 0.14, and THIS IS LIFE was at 0.12. Freeform’s SHADOWHUNTERS slipped 0.02 to 0.14. BET’s IN CONTEMPT ticked up to 0.13. Nat Geo’s GENIUS ticked up to 0.07.